I am not knowledgeable on the Pre Raphaelites really! I conducted tours at an art gallery on 3 of Rossetti's paintings a few years ago and know that the guys liked John's poems but I don't know a lot more than that. I don't know anything about Polidori either- I ought to have a read about him though! Cybele wrote: I think I read somewhere that Polidori was related in some way to the Rosettis." Yes! Polidori's beloved sister Frances later married Gabriele Rossetti, whose children included Dante, William and Christina Rossetti. So Polidori was their uncle, although of course he never knew them, having died before they were born. William Rossetti, Dante's younger brother, believed he contacted his uncle in one of the then-popular seances. Rossetti asked Polidori if he was happy in the afterlife, and received as an answer two raps, which meant "Not really" . 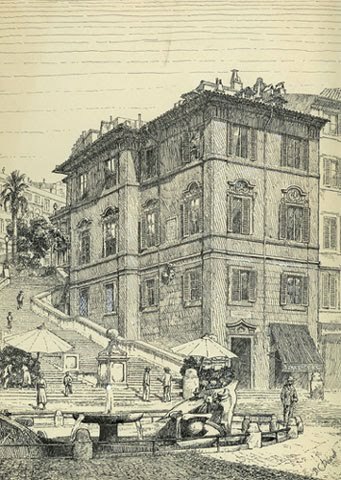 On a different note, I saw recently that scholar Dinah Roe is giving a talk at Keats-Shelley-House in Rome in a few days on Keats, Shelley and the Rossetti family. Would love to be there! The Pre-Raphaelites adored Keats's poetry - would be fascinating to learn more. Just received Richard Holmes' latest, Falling Upwards, so shall be becoming fully absorbed in that for a few weeks. You're so lucky, Saturn! I've been wanting to read that and am waiting for the paperback to come out soon. Enjoy! Trying to finish Water Isaacson's Einstein: His Life and Universe. Great read, always wanted to read a full bio on the man. Is that the same guy that wrote the recent biography of Steve Jobs? Saturn wrote: Just received Richard Holmes' latest, Falling Upwards, so shall be becoming fully absorbed in that for a few weeks. I just downloaded it a couple of weeks ago to read on vacation.. I'm guessing it will be a great read, given how much attention was given the the Great Age of Ballooning in "Age of Wonder." Or, maybe it's me. Maybe the book doesn't appeal to my own peculiar version of obsessiveness. Has anyone else read the Roe bio? Your opinion, please? Cybele, I know what you mean by an excess of minutia in the Roe biography, although it did not annoy me so much as his strained attempts to make his minutia relevant. For example, he declares (without any evidence to back up his claim) that Keats derived the images of the titans in Hyperion from two statues at the gates of Bedlam, and that the Temple of Saturn in The Fall of Hyperion has a dome because Keats had seen the domed roof of a bookstore called the Temple of the Muses. It seems to me that Roe was trying too hard to be original, to say something about Keats that hadn't been said before. Sid13 wrote: Cybele, I know what you mean by an excess of minutia in the Roe biography, although it did not annoy me so much as his strained attempts to make his minutia relevant. For example, he declares (without any evidence to back up his claim) that Keats derived the images of the titans in Hyperion from two statues at the gates of Bedlam, and that the Temple of Saturn in The Fall of Hyperion has a dome because Keats had seen the domed roof of a bookstore called the Temple of the Muses. It seems to me that Roe was trying too hard to be original, to say something about Keats that hadn't been said before. Yes, Sid13, Roe certainly can jump to conclusions! I deliberately didn't read any reviews so as not to unfairly judge it ahead of time. In retrospect, I surely should have! I bought a hardcover copy, quickly realized that the print was too small for me to read comfortably, bought and downloaded a Kindle version, and have started the darn book at least three times! I become so bored with it (I actually fall asleep trying to read it!) that I give up and read something else. However, one thing I will say in the book's defense is that the question of Keats's shortened apprenticeship and seemingly swift appointment as a dresser at Guy's has been answered to my satisfaction. I don't think there's any serious disagreement that Keats's apprenticeship did not go the entire five years.This is usually attributed to Keats having been a somewhat hot-headed adolescent. Roe convincingly argues that Hammond released his young apprentice because of his own ill health. (I think Roe even says that Hammond died while Keats was still at Guy's.) Again, according to Roe, Keats may have audited coursework without becoming an official student of Guy's medical school. Thus, he would have been known to the faculty at the school. That "missing" fifth year of his apprenticeship was fulfilled -- but it was fulfilled at the hospital. The appointment of Keats to a dressership so soon after he enrolled officially as a student is often explained with a "Well, Keats was really, really smart." And when I read this I just can't help picturing out guy as some almost-primordial Hermione Granger-type -- so crazily precocious that he could almost be in two places at the same time. Again, anyone else have some thoughts on this? Saturn - yes, Walter Isaacson just wrote a bio on Steve Jobs. His Einstein bio was solid, clear, accurate. Nice read. 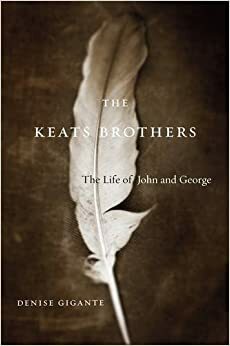 Interesting to see Keats life from the view of the three brothers together, and the main reason I got this was to read about George's life in America after Keats' death. Factually this seems sound and interesting but some of the asides, and literary flourishes are surprisingly a bit clunky. Would still recommend it but it's not destined to be a classic, but rather an interesting and needed biography. I started reading that book last year, but didn't get too far due to busyness in my life. I loved the opening paragraph in the prologue - it moved me very deeply. Though I can see Saturn's observations and Gigante does go on some lengthy tangents that can be burdensome, I still enjoyed the parts that I read. I actually emailed the author last year and she wrote back to say thanks and it was a privilege for her to study and write this book. She seemed to care deeply for it. Not really the tangents that I find a bit clumsy, it's generally well written, clear and factual but the little rhetorical embellishments at the end of paragraphs and things like that were sometimes a little corny and unnecessary. There are biographers who are poets themselves like Gittings and Motion etc but this just felt a little forced. I am enjoying it and looking forward to reading the rest and I'm sure it was a work of great care and hard work. I don't think I'd ever dare to have the courage email or contact an author, so well done to you for that, I'm sure she appreciated it! Authors are just people. If they put their email out there, then I think it's fine to use it Plus I am sure they like hearing from the reading public.